In many ways, the Dussehra of Kulu has few parallels, not only as religious ‘festival’ or a colourful annual ‘fair’, but also as a cultural phenomenon. For more than three hundred and fifty years, the festival, participated in by hundreds of thousands of visitors of ‘pilgrims’ from all over the hills, and outside, has gone on being held, year after year. The history of it alone is absorbing in the extreme; what is even more remarkable is the manner in which it has kept changing but without keep coming to Kulu, carried on their shoulders by devoted followers, walking scored of miles across hilly terrains; year after year Rama a ‘Raghunathji’ leaves his temple-home and camps in the chaugan of Kulu to receive their homage; year after year exchanges of the utmost courtesy keep taking place between gods and goddess cast in different moulds classical or folk. All this while, everything is bathed in the colours of marigold, and music fills the air. The present volume the first of its kind, explores this fascinating territory and invites the reader to take the same journey. There is not only history in these pages, but also understanding: a measure of delight and spiritual upliftment. Karuna Goswamy, is an eminent historians of Indian culture. Formerly Professor of History at the Punjab University, she has distinguished writing to her credit. She is the author of Vaishnavism in the Punjab Hills and Pahari Painting (Chandigarh, 1968); Wall painting of Sujanpur Tira (New Delhi 1971); The Glory of the great Goddess (Zurich 1989); Kashmiri Paintings; Assmilation and Diffusion, Production and Patronage (Shimla/New Delhi, 1998). Her most recent work is wondrous Images Krishna Seen as Srinath-Ji; Pichhwais of the Vallabha Sampradaya in the Collection of the Calico Museum and the Sarabhai Foundation (With B.N. Goswamy), Sarabhai Foundation, Ahmedabad, 2014. Currently another book of professor Goswamy is under print from the Indian Institute of Advanced Study, Shimla; Diliparanjani; An 18the Century Chronicle from a Hill State. The present study, dedicated to one of the greatest festivals of the state of Himachal Pradesh, the Kulu Dussehra, was conducted over a sizeable period of time. Four times over the last seven years that I have been engaged in studying the Dussehra, I have stayed in Kulu for long stretches, observing the festival closely from the day it begins-sometimes even before it does-till its very end on the seventh day. I was drawn to the subject early on while working on Vaishnavism in the Punjab Hills and Pahari Painting, the subject of my doctoral dissertation. For in the Kulu Dussehra were reflected many cultural processes at once: the role that the Rajas of the hills played in the spread of the 'newly-arrived' faith; the acute thinking that must have gone into the effort; the accommodation in practices that had to be made before any headway could be made by the classical faith; the setting up of a rich and colourful festival that would on the one hand catch the imagination of the people and, on the other, somehow bind them and the outlying areas of the state, together, while allowing the folk to stay within the spaces of the faith that had been theirs long before the wave of Vaishnavism came to the hills in this form. But undertaking field-work, seeing the Dussehra from close, interviewing people ranging from the Raja and the Sanskritic priests to village-centred gurs of local deotas and common folk drawn to the festival, provided me with different insights into this great cultural phenomenon, leading me to understand a bit better how cultural processes work. The opportunity to put it all together came, however, in the three years that I have spent as a Fellow at the Indian Institute of Advanced Study. These years enabled me to order all the information that I had been collecting, in the form of words and images and sounds, and allowed me the opportunity to examine it against the theoretical frameworks that several scholars have been working with, in India and elsewhere. In many ways, the Dussehra of Kulu is an 'event' that has few parallels. For more than three hundred and fifty years, the festival, participated in by hundreds of thousands of visitors or 'pilgrims' from all over the hills, has gone on being held, year after year. As a cultural event, it has been written about by many, some of them learned persons who belong to this region and have done much field-work; but as a cultural phenomenon, it has only been thinly studied till now. I have been particularly interested in tracing the history of the festival, in trying to understand the complex set of reasons for its being founded as a 'State Festival' in the 17th century, in following the changes that it has undergone over the centuries, and in analyzing the causes behind its uncommon longevity. To describe the great festival can be engaging. Briefly put, the Dussehra celebrates, like in the rest of India, the victory of Rama; here, in Kulu, however, it was started early in the third quarter of the 17th century as a 'State Festival' by Raja Jagat Singh of Kulu, soon after he became a convert to Vaishnavism, following a dramatic event in his personal life. He is believed to have been instrumental in bringing to Kulu from Ayodhya a small metal image of Rama-widely known locally as 'Raghunath ji' -and installing it in a temple attached to his royal palace. 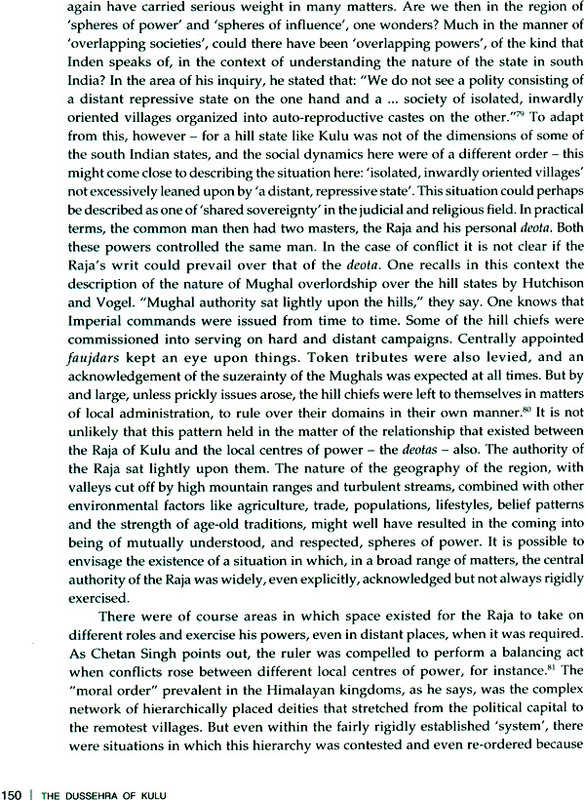 He declared Vaishnavism as the state religion of Kulu, but it could not have been easy, for the area was dominated by shrines raised to local or regional deities, celebrated as 'devis' and 'deotas', to whom the hill folk owed impassioned allegiance. Many of these 'gods and godlings', as they have been called, bore the names of deities and rishis known to classical Hinduism; others seem to have been of purely local, tribal origin; a great many were completely unknown outside the region, as were the ways they practiced their faith. On the one hand, one gets names like Shesh Nag, Parashar Rishi, Tripurasundari, and on the other Hidimba Devi, Jamlu Deota, Phungani Devi. The Raja appears to have conceived the idea of inducing, or forcing, all these local deities to come once a year to Kulu to pay homage to Rama. The Dussehra festival thus got founded, and has been going on ever since. Year after year these deotas travel, each accompanied by his or her groups of priests, shamans, devotees, their 'mask' -like images carried by them in rath-palanquins on their shoulders to the accompaniment of music. The images arrive in Kulu, pay homage to the Raghunath idol, and then camp on the chaugan of the place. The Kulu Dussehra, however, is not only a religious or cultural event. It has always had dimensions that are equally political and economic, for it turns into a visible sign of the assertion of authority as also a commercial and trading event. Long after Vaishnavism has lost its status as the religion of the state, and the authority of the Rajas of the state of Kulu has gone, the Dussehra festival continues to be held. But great changes have taken place. A new kind of politics comes into play now; new devis and deotas are being added, some of them founded or invented by low- caste groups or communities; the form remains but rituals have undergone modifications; the quantum and the form of homage is now different than it was before. This study draws attention to these and other matters. It remains an outsider's view of this complex phenomenon, but it is at least a deeply interested, and sympathetic, outsider's view. If this work has come to fruition, it is because of the help and support that I have received over the years from so many people and institutions. To acknowledge these debts here is a pleasure. Words are imperfect vehicles of expression and cannot in any way discharge even a fraction of the indebtedness that I feel for all those who helped me reach this point. It was their generosity and understanding that helped me in pursuit of my dream despite all the personal difficulties that came my way. My sincere thanks go out to Professor Bhuvan Chandel, who was the Director of the Institute when I joined as a Fellow. She both supported and encouraged me in more ways than one. The Chairman, Dr. Mungekar, and, later, the Secretary, Mr. Madhukar Sinha saw me through difficulties of rules and regulations with a graciousness that was soothing. I feel also greatly indebted to the former Director of the Institute, Professor Peter O'Souza, who took very kind interest in this work, and to the present Director, Professor Chetan Singh, under whom it is now being published. I have always greatly benefited, now as I did in the past, from Prof. Chetan Singh sharing with me, with customary generosity, his insights into the society and the politics of the hills. These have been invaluable to my work. To Dr. Debarshi Sen, Academic Resource and Publication Officer of the Institute, I remain grateful for his support to this project. The list of my debts is long, and kept growing. I am grateful to Dr. Prabitra Kumar Ray, Dr. Meenu Agarwal, Mr. Ashok Sharma, Mr. Majumdar, Mr. Kundan Lal, Mr. Mela Ram and Mr. Bhrishtu Ram, for help during my stay at the Institute in a manner that was heart warming. I also received extremely valuable support from Smt. Pushpaji, Mr. Bhardwaj and Ms. Neeraj Sharma of the library. Without their alacrity and deep desire to help, I might never have reached this point in my work. Mr. Narain Dass and his strong and loyal team headed by Manuji, Girdhari ji, Rakesh, Rajesh, Roshan, Soni, Dev Raj and Jeet Ram are never to be forgotten. Devinder from whose canteen flowed tea, delicious, hot and sweet, lifted the soul. Om Prakash and Kesar Singh with their sharp intelligence and quick dispatch saved me valuable time. Vijay shed light in more ways than one and Vijay Lakshmi healed with the balm of medicine. Things took a shape only because of Pinky's vital role of the sustainer. Gopal helped in a very basic way and kept the atmosphere full of good cheer and a spirit of protectiveness. The IT back-up I received was extremely helpful. Casting my mind back to the point in time when I began my researches, I cannot forget the help extended to me by Dr. Vidya Chand Thakur, Dr. Sita Ram Thakur, and Or. Vidya Sharma. Their erudition and intimate knowledge of their culture sensitized me to so many issues and nuances that would have otherwise escaped my notice. 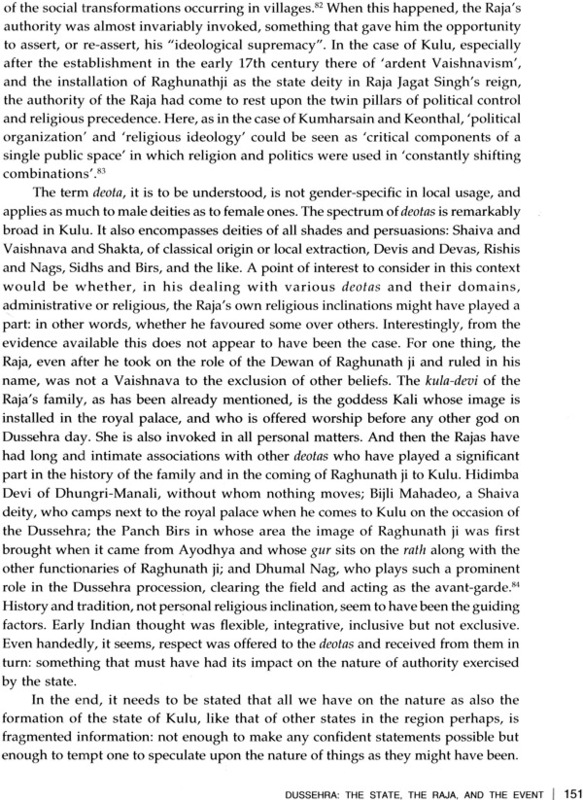 My most sincere thanks are due to Raja Maheshwar Singh ji and to the senior functionaries of Raghunath Temple, e.g. Bhatu ji, who spared their time and tried to answer all my queries at a time when they were extremely busy with the organization of the Dussehra on different occasions. My thanks are also due to Mr. Prem Sharma, the then Director, Department of Languages and Culture, to Mr. Garg and Mr. Dev Raj, the Librarian of the Academy, who kept me abreast with the latest publications. For the visuals I owe a great deal to Mr. Birbal Sharma of Mandi and Mr. Kuldeep Chauhan of the Tribune. When I needed help with the maps, Professor Swaranjit Mehta and Professor KD. Sharma of the Department of Geography at the Panjab University were most generous. Their understanding of the area that I have been working in, and the expertise of S. Mohan Singh, proved invaluable in this task. The care and courtesy shown by Mr. Madhav Shyam, Deputy Director of the Census of India at Chandigarh, who located for me vital information, puts me greatly in his debt. My debts of gratitude would be inadequately discharged if I were not to record my warm thanks to our friends, Dr. Eberhard Fischer and his wife Barbara Fischer, in whose company I first turned my attention to the Dussehra of Kulu. I am equally grateful to another friend, Deepak Sanan, for it was he who helped me access crucial documents having a bearing on my project. From another kind and gracious friend, Mrs. Lakshmi Chetan Singh, I have always received warmth and generosity in rich measure. At Chandigarh, Professor Mahesh Sharma was always a source of strength and gave unstintingly of his time and expertise whenever I needed it, adding to my understanding his intimate knowledge of the hills. While Shehnaz Pathania was her giving self in securing for me an important map, the work of giving shape to the manuscript was done not only with efficiency but also the warm and friendly care of Mr. Dharam Vir of Skill Spot at Chandigarh. Words are not adequate to express my gratitude to my husband, Professor B.N. Goswamy, who was always his patient and generous self. But for his help this work may never have come to fruition. For their understanding, affection, and timely help, I am beholden to my children, Apurva and Malavika, who too were always there for me, not to forget little Damini and Madhav. And last but definitely not the least, it is for me to acknowledge the great help that the conscientious and strong team at home has been: Bhag Singh, Gurnaib Singh, and Ravinder.